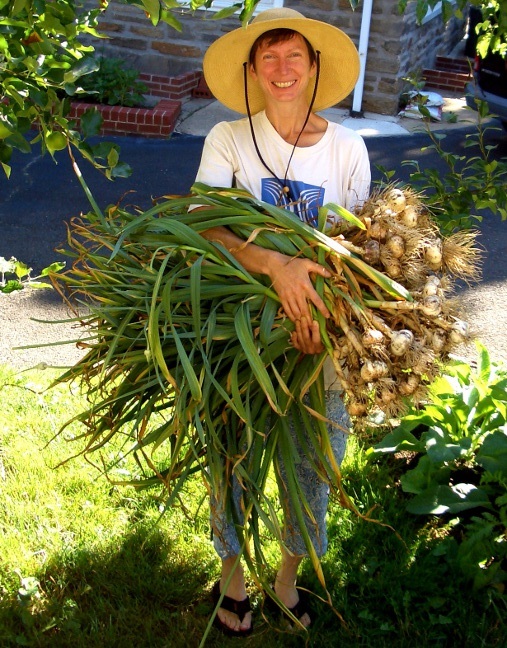 In July of 2006, I moved in with J who lives in Elkins Park, a suburb of Philadelphia. His house is on a small lot which was landscaped in a conventional suburban style. I volunteered to take on the job of lawn maintenance. Things began to change. I read about square foot gardening and planted raised beds in the backyard. I learned about permaculture design and grew corn, beans, squash, pumpkins, and sunflowers in the front yard. Most recently, I took Dave Jacke’s edible forest gardening workshop, am designing and planting fruit tree guilds, and ponder pawpaws. We obtained a couple of beehives and are preparing for the chickens. The time I spend mowing is minimal. I play outside and and am getting to know my neighbors. I like that. I’m new to blogging… and lots of other stuff. My husband and I turned out front lawn into a garden this year too! It’s so much fun being outside, talking to any neighbor that passes by. I live in CA, so the weather is much better for beginning gardeners like myself. Everything you do is beautiful! love it! This is so neat! Congratulations! Looking forward to meeting you on Monday. I have a friend who lives near you who you may like to meet. Wow, this is my old house!! We lived there from the mid-70’s to the late 80’s. So neat to see the article in the paper with the picture of our old sun porch!! I’ve lived here for 6 years and J has been here for more than 20. This is a wonderful place to be and I’m discovering that more and more! When I was speaking to the author of the article; she kept on noting that Elkins Park is “..an enlightened community!” Why don’t you stop in sometime? I would like that very much!! Thank you for the kind offer! I stopped by one time in 1992 and said hi to everyone who lived there so I must had met J! I would love to show my husband and young son your garden! !